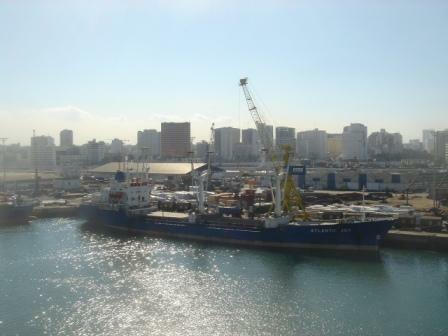 Downtown Casablanca, from the port. Back from a terrific few weeks of exploration – a time to fall even further in love with Lisbon, to wander in Portimao and the Algarve, to stroll through a surprisingly robust and lively Cadiz (the presence of the University guarantees bustling activity, and endless streams of screaming motos rushing down incredibly narrow streets) and to spend some time getting to know a real puzzle of a place – Casablanca. Casablanca is a rocket of a city. It was a town of 12,000 in 1906, grew to 110,000 by 1921, and today is home to almost 4 million people. 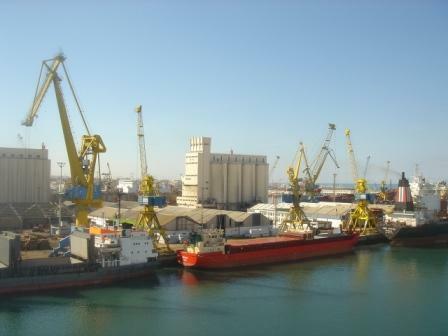 It is the sixth largest city in Africa, and its port is one of the busiest on that continent. The city is a mid to late 20th century construction, featuring many radial streets, thanks to the French, wrapping around older (or poorer and thus ignored) enclaves, like the Ancienne Medina, and a downtown of dozens of hideous modern buildings. Casablanca is frenetic, chaotic, at once wealthy and very poor, scruffy and not very nice to look at (the fading art deco architecture notwithstanding), and incredibly polluted. We smelled the city long before we arrived. 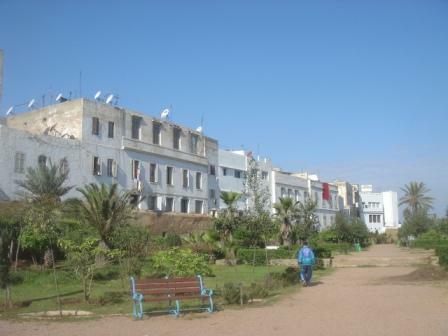 Morocco is an ambitious and mostly healthy nation, economically stable, and eager to grow. But as we sat watching dozens of ships unloading endless piles of stuff at the docks, and tasted the grit of the phosphate being emptied into cargo holds nearby, one thought kept recurring: What do they think they are doing? What’s going on here? Well, the basic aims seem clear: Casablancans want growth, job creation, increased wealth. But here, as in any exploding urban center across the globe, the growth comes at a steep, and certainly not sustainable, price. They are building to a set of urban templates that are completely obsolete (increasing sprawl and suburbanization, auto dominance, poor public transportation, single-use buildings and districts, enormous abuse of the local environment, and problems with water scarcity, to name a few). And they are going as fast as they can. Here’s an example. Outside the walls of the Old Medina. The Atlantic, and new construction, is just to the right of this image. Now literally across the street from the walled district there is a massive redevelopment project underway, the Marina de Casablanca. 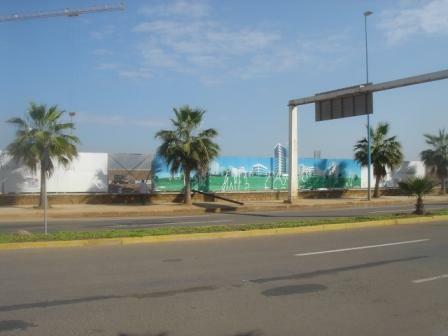 The Marina de Casablanca construction site. 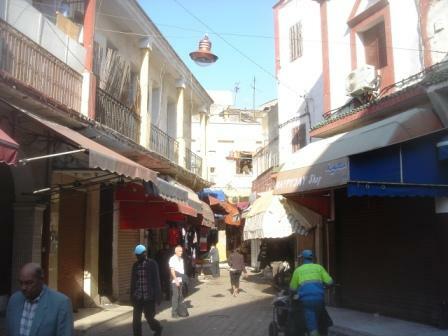 The Old Medina is just behind and slightly to the right of the development. That’s the amazing Hassan II Mosque at the far right, the biggest in the world, with the world’s tallest minaret, designed by a French architect and completed in 1993. 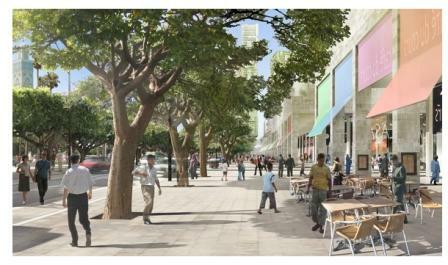 The Plan of the development will give you an even better idea about the relationship between Marina and Old Medina. The Old Medina is at the right hand bottom of this plan, and is easy to identify – it’s very, very dense. So now what? The Marina project is banal and pedestrian at best, and derived from the worst of late 20th century western/modern urbanism. It is not sustainable from multiple points of view: long term sustainability and durability never seem to have crossed anybody’s mind as it was conceived. Simply, it is a very expensive mistake in the making. And it’s immediately adjacent to a fragile, poor, and completely fabulous urban artifact which is the Old Medina. Can the Medina survive the bling of the new? We’ll have to go back in a couple of years to find out, but there is cause for apprehension. 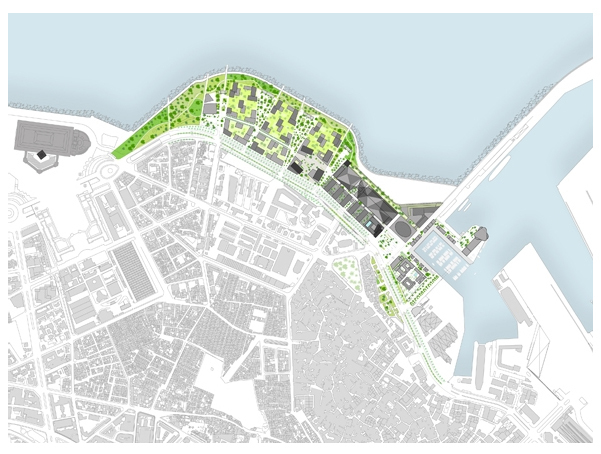 The models for building the next city are all around us, if we only look. 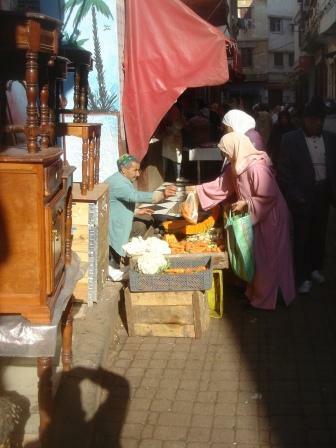 They are in the Old Medina, with its density, its constant change and yet constancy, its vivid life and richness. Why Casablanca wants to be like everywhere else, when it can be so durably and amazingly itself, is a real, and sad, puzzle.